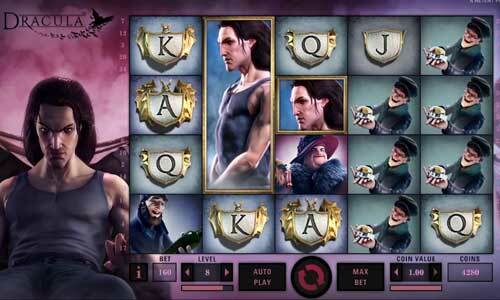 Dracula is one of Net Entertainment’s newest online pokies. This game was launched in 2015, and contains some of the Swedish online casino software developer’s finest graphics yet. Dracula features some really inspiring special features, and contains nifty imagery, all of which is Net Ent’s own take on the famous Bram Stoker novel. Developed in coordination with Universal Studios, this pokie game features a 5×4 grid, so there’s plenty of imagery on those reels. Upon its 5 reels, there are a total of 20 paylines. That might not seem like a lot, but remember, there are plenty of icons on those reels. Dracula will permit players to choose their betting levels (from 1-10), and the amount each coin is worth (from 0.01 up to 1.00), but not the number of lines. On a minimum stake (no pun intended), players are going to be wagering just 0.20 per spin. At its most costly, Dracula could frighten you with a 200.00 per spin maximum wager. Play With $300 + 100 Free Spins Play Now! Wild symbol: The “W” acts as the wild symbol in Dracula. Wilds are capable of appearing on the second, third and fourth reels, and can substitute themselves for all other icons, without exception. They do not have a cash value of their own. 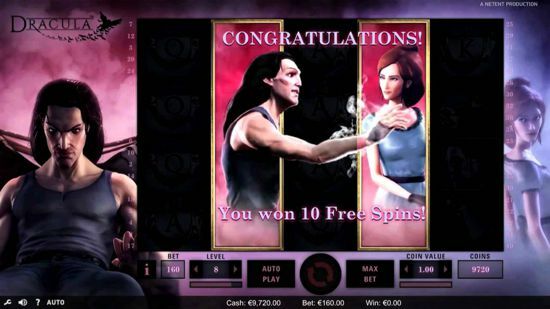 Bonus icons:If a player is lucky enough to land the stacked Dracula symbol on the second reel, and the stacked Mina symbol (known as the lady icon) on the fourth reel simultaneously, then they will trigger the free spins bonus. 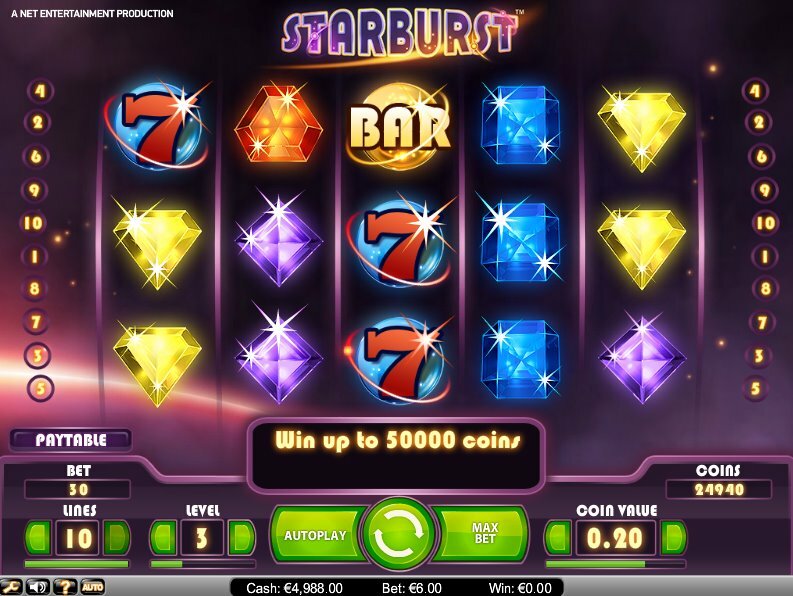 Free spins:The player will begin the free spins bonus with 10 free games. During this bonus, The Dracula and Mina icon can appear together as a special stacked wild. It only appears on the third reel, though. 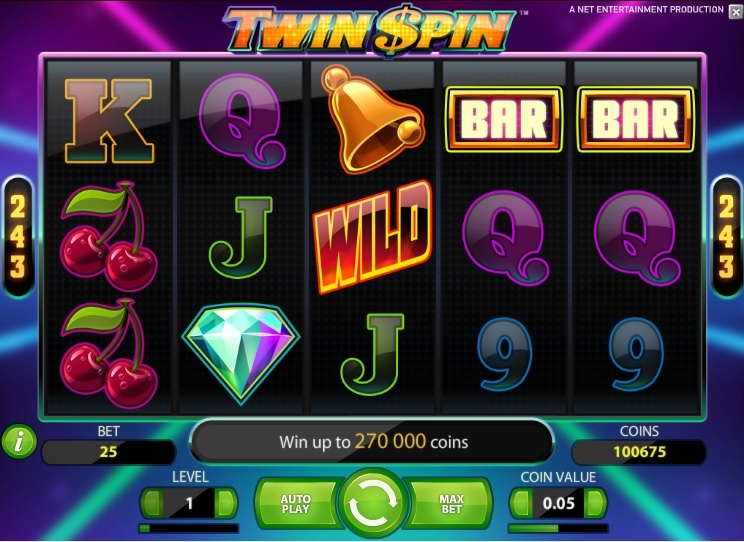 It will also grant 2 free spins when located in the bonus game. Bat feature:During the base game, a Bat feature may be randomly triggered. When it is, bats may fly onto the reels and turn many symbols into one of a particular kind. During the free spins bonus, this feature is activated at the start of every single spin. It is possible for these bats to turn into wilds, too. The best paying icons in the game are Dracula and the lady. When either of those symbols is located 5 times on any active payline, the player will win a total prize of 200 coins. Of course, if you get those symbols across all of the reels, the prize can rise to be worth up to 80,000 coins. Dracula is new, it is hot and it is entertaining. This pokie represents one of many partnerships between Universal and Net Entertainment. The Bat feature is arguably the best thing about this game, since it seldom fails to deliver big cash prizes when it appears in the base game. It is a bit less useful in the free spins bonus in our experience, but that doesn’t mean it won’t come up trumps for you, when you play this video pokie.